Erik v.D. submitted this photo and caption. This picture of two Dutch baritone players who marched together with the Glassmen in 2008 was taken in Dendermonde, Belgium. The Christmas ensemble of Jubal performed a couple of gigs at their Christmas market. When Joury N. (right) and Erik v.D. 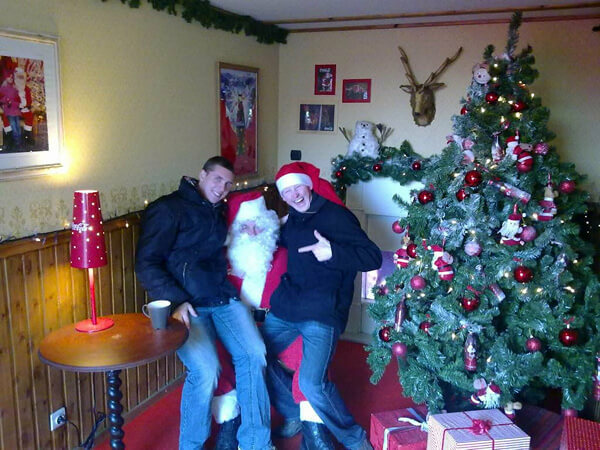 (left) were looking for something to eat, we stumbled upon Santa himself and we queued up and took our chances.